As excitement about new film “Star Wars: The Last Jedi” has reached fever pitch, it’s worth reflecting on those behind the enduring popularity of the Star Wars universe: the fans. The Star Wars community has fueled the success of Star Wars themed toys, games and products for several decades. It’s this dedication that has led the Star Wars Limited Edition POWERbot™ to become the most popular design, selling more than five times the number of previous POWERbot™ models when comparing launching period. Samsung’s design team reveals how they worked with the Star Wars community to create a product designed by fans, for fans. The device strongly evokes the likenesses of two of Star Wars’ most iconic images: the masks of Darth Vader and a Stormtrooper. Each edition includes the detailed features of the two characters, particularly their sounds. For example, when the Darth Vader unit starts, the vacuum will play ‘The Imperial March’ and mimic the Sith Lord’s chillingly mechanical inhale and exhale. When you turn on the Stormtrooper version, you will hear ‘let’s go’ with the theme song playing in the background. 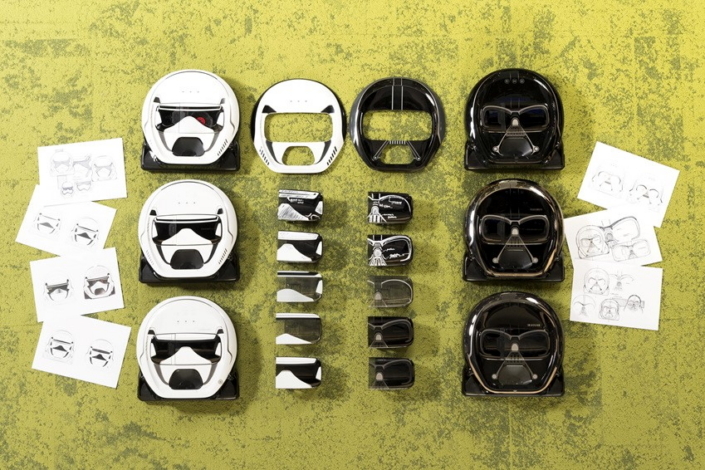 Different types of drawings and mockups created by the Samsung Electronics design team for the Star Wars Limited Edition POWERbot™. To fulfill user expectations, Samsung Electronics also collaborated with an online community of Star Wars fans. The members of the community are so passionate about Star Wars that many of them say being a Star Wars fan is their job. Some decorate their vehicles with Star Wars images, and others mimic the voice of Darth Vader. In fact, a member of the online fan community provided the voice for the Darth Vader edition POWERbot™. The collaborative efforts with 20 members of the online fan community helped the design team to come up with the most detailed features, such as the color scheme, the number of grills, how deep the eyes should look and feel, and other different details. As the two sides worked together, the POWERbot™ continually evolved. The designer’s task was to create a product that conveys that essence of Darth Vader from the movie. To find the perfect design, the team members focused on the color and the appearance of the eyes. The eyes obscured by the mask on Darth Vader’s face create a particularly sinister feeling, so the design team made that part of the product even darker. Yet if the shape of the eyes was even slightly irregular or asymmetrical, the whole look was distorted. The team went through a lengthy process of trial and error as they changed the dimensions over and over again, with similar painstaking attention to detail required for the Stormtrooper model. Thankfully, the design team was able to locate a silk printing expert who lives in GwangJu, a city 268 km away from Seoul. This expert was invited to consult during their business trip to Vietnam, where they visited the production site and conducted training sessions fitting the design to the POWERbot™. It wasn’t just the appearance of the POWERbot™ which was transformed: the design team applied the Star Wars concept to every part of the Star Wars Limited Edition POWERbot™. In addition to an eye-catching design, the Star Wars Limited Edition POWERbot™ promises all the powerful cleaning technology and features of the original VR7000. CycloneForce technology offers high-end suction power and Edge Clean Master, helps the unit clean close to walls and edges. What’s more, the product has a Navigation Camera that recognizes the structure of the entire house and finds the fastest cleaning route and the FullView Sensor 2.0 that allows the unit to clean around home decorations and valuable personal items as small as 10mm. This is the first time that Samsung Electronics has applied iconic movie characters to its home appliance products. 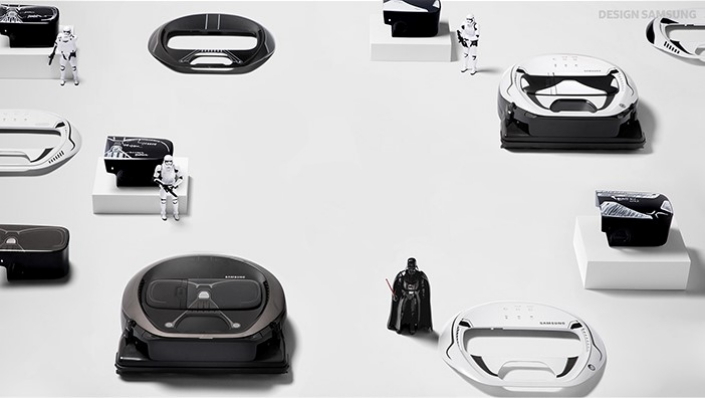 Samsung hopes that the Star Wars Limited Edition POWERbot™ can help users feel that cleaning is no longer a chore, but is something they can enjoy doing, as they try the many different fun features.